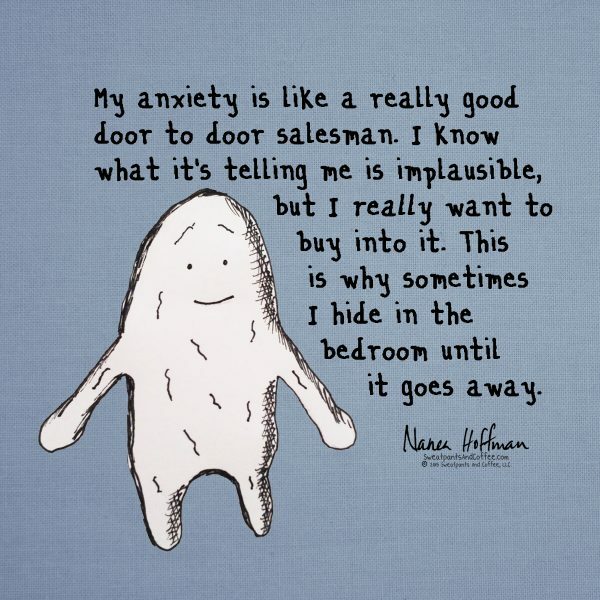 Today was a high anxiety day. I could feel it floating in the air like dust motes. The morning went like this: alarm – panic attack, doorbell – panic attack, prepare breakfast and meds for my mother, assess messy state of house – smaller panic attack. Crawl back into bed. Take Xanax, open laptop, begin day’s work. There’s not much to do when this happens. I wrap myself in my softest robe, drink warm, soothing things, and repeat the litany of “I’m ok, I’m ok, I’m ok” in my head – the words whirring like a sewing machine against the buzz of my unquiet thoughts. What if you aren’t just walking along the street right now? What if you are actually running a marathon? Let’s breathe hard and sweat, just in case. Everybody hates this dress. Including that little kid in the stroller (why do you think she’s staring at you?) and that stray cat. It will probably hate-pee on you, and you deserve it for wearing this atrocity in public. I bet ringing doorbells is a favorite trick of home-invasion robbers. Because no one thinks they’ll do that. You open the door to tell them you don’t want any more magazine subscriptions and then BAM! You’re in a hostage situation. Don’t answer the door. Go barricade yourself in the bedroom for safety. Did you forget to put on deodorant? You forgot to put on deodorant. That must be why you’re sweating so much, and plus, you can’t really smell your own B.O. so you can’t tell that you smell like a chili cook-off right now. Yes, you remember putting on deodorant, but what makes more sense? That memory or this giant puddle of perspiration? You know I’m right, you smelly, pathetic loser. Hey, remember that thing you said at that party five years ago? It was horribly offensive. Let’s think about that for the next three hours. YOU’RE LATE FOR CLASS! YOU’RE LATE FOR CLASS! Yes, you graduated from college years ago, but there’s this one class you never went to and the final is right now and you’re late! No, this isn’t a dream. Ok, maybe it’s a dream. But that doesn’t matter. Freak out anyway! A tidal wave could happen at any moment. Like, right now. If you go on that balcony, it will definitely collapse. It looks structurally sound, and sure, all those people are standing on it, but you are probably going to be the feather that broke the camel’s back. Or the balcony. Anyway, you weigh considerably more than a feather. You should stay off that balcony and then go home and diet forever. Those cute little birds are probably carnivorous and thinking about attacking you. That person complimented your work because she thinks you are addled and she feels sorry for you in your state of obvious mental decline. You are a talentless impostor. What if there’s, like, an entire nest of spiders living inside this mattress? YOU SENT A TEXT WITH A TYPO. You have failed as a human being and will never be loved. I try not to feel guilt for what it’s like to be around me. I live in a house with four other people. My husband and son are AV geeks who like high def movies and surround sound. They want dim lights and big screens and subwoofers cranked so that the house shakes with the sound of crashing waves and explosions. I need the house to be bright and quiet. My daughter chatters constantly and leaves a trail of artistic mess in her wake – scraps of paper, pens, glue, beads, feathers. The chaos makes me want to rock back and forth. When it’s really bad, my world shrinks to the size of a king sized bed. From it, I can sort of function – laptop, phone, snacks – but because I know I’m not totally there by choice, it feels like failure. I’ve got the blinds open and sunlight streaming in so my mind doesn’t go full dark, but my thoughts are frenetic. Outside, I’m sluggish. Inside, I’m Animal the Muppet performing a drum solo. It never lasts. I know it. It’s nobody’s fault. Sometimes there’s a trigger; sometimes it just happens, like the weather. I go through my list of responsibilities and try to figure, realistically, what I can do and what I can cut out. I’ve learned to ask for help and to accept it when it’s offered. My self-loathing recovery period is not nearly as long as it used to be, though it is still excruciating. I take another Xanax like a prayer and try to have faith that it will bring balance to this body that feels as if it is under threat of imminent attack. I drink some water, pull the covers tighter, and wait. I always prepare my morning coffee to start my day. Black coffee for extra boost for a busy schedule or just keeping my anxiety level down — coffee is my cure.